Well, that was a nice long break. Amid the relative insanity that is having a three-year-old, it seems that two years have gone by. Our gaming group dissolved quite some time ago, mostly due to scheduling challenges. 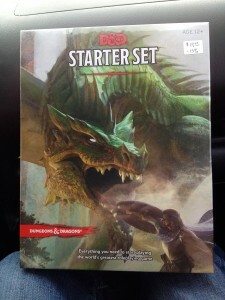 While I haven’t been closely monitoring the situation, I was very pleased to see the release of the new version of the D&D Starter Set and the new Player’s Handbook this week. I have been watching on social media as the D&D development team worked diligently to gather feedback, and based on the little that I’ve explored so far… this feels like D&D again. I have briefly scanned through the new (free) D&D Basic Rules PDF and the PHB spell list and there’s a lot of classics present. Several lucky sites have been previewing the different classes and it evokes a very D&D 3.0/3.5 feel to me, which has piqued my curiosity quite a bit. That being said… I think it’s time to get the band back together.